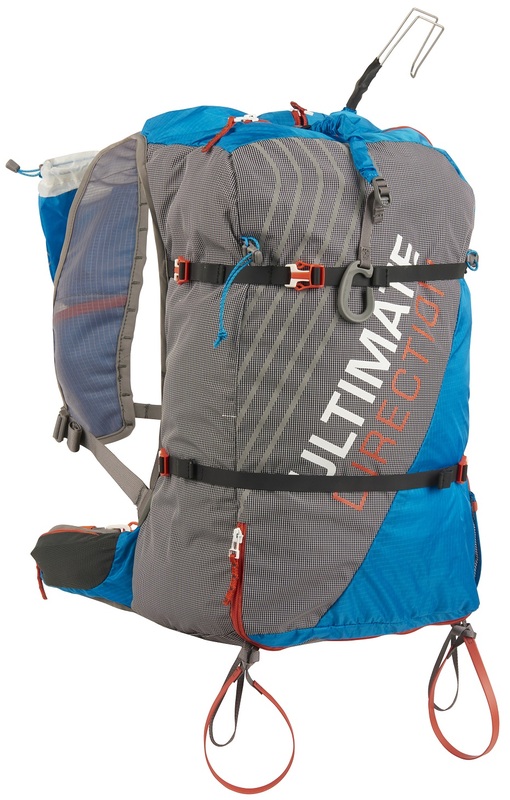 Ultimate Direction packed everything you need for ski touring and mountaineering into the Skimo 28 vest. 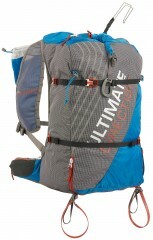 It is one of the most full-featured packs out there, with access from the top, bottom, side and back. Avalanche gear has a special compartment with probe sleeve that you access from the bottom. A crampon side-door lets you stash ‘pons or anything else. Back-access lets you cushion your back with clothing layers or skins which you might want close to you for warmth. The top-corner zip opens to the biggest area for everything else. Oh, and don’t forget all the storage in front, since this is an Ultimate Direction vest after all. Hydration, fuel, camera, clinometer, you name it, all within reach. The Skimo 28 is a marvel of athlete design, and you’ll likely see some on the Grand Traverse and the Grand Teton. 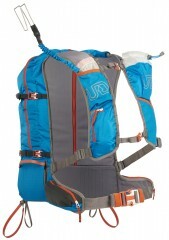 100D Triple rip-stop nylon is light, breathable, and durable. Back-access pocket for layers, skins, or a hydration reservoir. Side-access crampon box is gusseted for easy closure alignment. Bottom-access zip for avy gear with drain holes to manage water. Multiple quick-carry ski and snowboard systems add versatility. Mesh pockets on the hip belt are great for camera and food. Two ice-axe holders means full support for technical missions. Flask sleeve on the front along with gel and stow pockets. Access Tip, bottom, side, back! Bottom Line Max features, minimal weight. This does what it should so well in winter. You can strip it and it is good in summer. The compression straps are stiff and hard to tighten but work and don’t wear out. It is a bit boxy, but not an issue in a pack this size. Smallest pack that could carry 2 pair skis, and does have a tow hook contrary to the description. Is the race hook removable? I'd probably want to use this for long day hikes/runs where I need more gear than I can fit in a running vest and would prefer to do without the hook if possible. Hi Mike, yes the race hook and the wrap-around strap are both removable. From Colorado. Used the product several times, including one 4000' rando-race, and one multi-hour speed tour/training session in blower conditions. First impressions: great quality, sleek and functional design with well-thought-out features that simply work well, like they're supposed to, and body (running) vest style is very comfortable and can be adjusted to have weight on the hips if you pack heavy. Very light, as you can imagine, but the main compartment fabrics feel rather robust that will take thoughtful daily abuse- as with any light equipment, some respect is required. Here's a few things that are not included in the typical write-up... interior is white which makes for easy finding of gear, crampon compartment is a useful pack-on quick-access spot for water bottles, extra gloves, etc., the water holder on the left shoulder strap can easily fit any cycling-style water bottle (even 24 oz sizes, or like the CAMP straw style)- so you don't need the collapsible bottle to make it work, and all the buckles have integrated magnets that make closure just a bit faster (cool feature that more pack-makers should use!). Note that the design of the buckles make closure slightly finicky at first, but you'll quickly get used to it. Only make drawback, which can be easily fixed, is that the shoulder ski holder bungee is slightly long, which prevents the diagonal carry (the reason for 1 star deduction)... I'll be shortening mine to make it carry better, so it should be a non-issue. All in all, a very respectable pack that UD put a lot of thought into- you'll be pleased with it. I was wondering if you figured out a good way to carry a helmet on the pack?